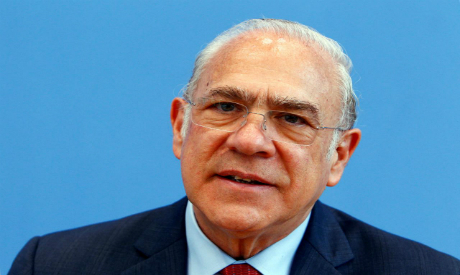 The head of the Organisation of Economic Co-operation and Development (OECD) Angel Gurría has hailed the economic reforms that adopted by Egypt over the past four years. The OECD secretary-general made the remarks during the inaugural session of the "Private Investment for Sustainable Development" conference which is currently being held in Paris as part of the week on the role of responsibilities of the private sector in achieving the Sustainable Development Goals (SDGs). Gurria cited Egypt's promising economic programme which is aimed at achieving inclusive growth with effective and sustainable participation of all parties. The legislative reforms that have been carried out by Egypt recently created a suitable business climate that is capable of luring more investments to the country, Gurría said. In her speech, Egyptian Investment Minister Sahar Nasr underlined the major role played by the private sector in achieving the SDGs at both national and international levels, said a statement released by the ministry. Nasr said that Egypt is committed to working on achieving fair economic and social development by engaging all parties concerned with the development file. Nasr highlighted Egypt's reforms which created an environment that encourages the private sector to participate in the development process, citing the investment law which offers tax incentives ranging between 30 and 50 percent for investing in the national projects and small and medium-sized enterprises.